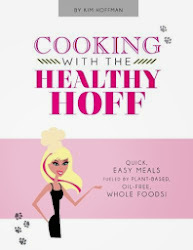 The Healthy Hoff: Cotton Candy Grapes Are Here! Yes, you're reading the title correctly. Those wacky farmers in Cali have developed a grape that tastes like cotton candy! No GMOs here! These seedless grapes are the natural result of plant-breeding - created by cross pollinating wild grape species. A happy little accident if you will. I finally got my hands on some this past weekend at the Heinen's in Middleburg Heights, Ohio. The lure of a cotton candy tasting grape won out over the $7.99 price tag! While I can pick up on a faint smell of cotton candy, these grapes don't taste like cotton candy to me. 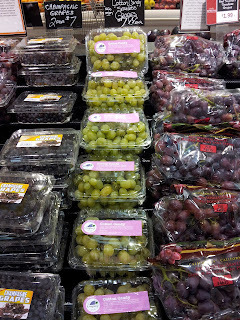 They are however, more mellow and less sweet than normal grapes, which actually suits my palette just fine. But unless these babies drop in price, I probably won't be indulging again anytime soon. Don't get me wrong, they are good grapes, but the price is extreme; especially if I'm not getting the cotton candy effect. Don't be deterred by my experience. Plenty of people can taste & even smell the cotton candy. So, I encourage you to seek these babies out and come to your own conclusion.